On Wednesday 24th June we launched the Work. Shop. Play. Project at the Walker Street Art Gallery in Dandenong. Mel (Sustainable Everyday), Emina (City of Greater Dandenong) and Emily (Sustainable Everyday) launching the Work. Shop. Play Project for Central Dandenong. Neera from Images at the Launch! Uncles Small Goods at the Launch! Mayor of Dandenong at the launch! Mayor Sean from City of Greater of Dandenong and Neera from Images in Dandenong with the Work. Shop. Play Cart which has been locally designed and manufactured. Miranda and Amanda from Comms at City of Greater Dandenong. Thank you for your support! Mel from Sustainable Everyday Handing out the publications. Congrats on your wonderful work Mel! A successful food box delivery service experiment took place on the 19th of June. "It was wonderful to see the volunteers from the ASRC getting involved on the day, they were keen to get in there and help out as much as possible. It was obvious they wanted to make themselves useful wherever they could and they were enjoying the rewarding feeling of contributing to a group task." "While the volunteers are unable to work now they will all hopefully be granted working rights in the future, involvement with the market and the Dandenong community will provide them an excellent gateway into the workforce. 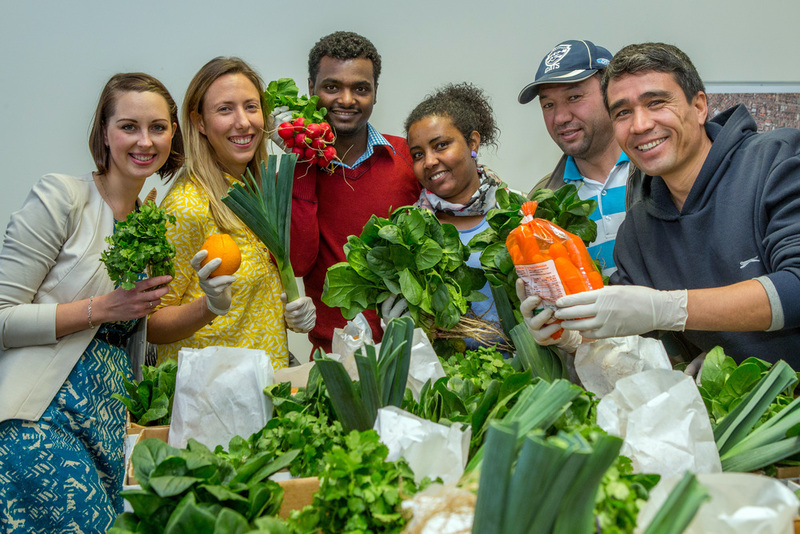 The foodbox project is a unique opportunity to give the ASRC volunteers a foot in the door of the job market while also providing them with fresh food, connection to a new and broader community and a sense of purpose we all deserve to have. " Interest from a potential customer (one of many comments!). "I would love to be involved in the Food Box program and order a weekly box if at all possible. Excellent initiative BTW :)"
On Friday 19th of June we had a really successful day creating 15 fruit and vegetable boxes with volunteers from the Asylum Seekers Resource Centre. The volunteers were wonderful helpers and we all got a lot out of the day. - Boxes full of fruit, vegetables, artisan bread, nuts and spices! BLOG 7: Social Enterprise Potential? Food Box Delivery in Central Dandenong? On Friday 26th of June a workshop will be held at the City of Greater Dandenong outlining how office workers can start a food club. To launch these actions and hand out the offers booklet please come along to our event on Wednesday 24th of June between 11am - 2pm. Please share this invitation with your colleagues. The more the merrier! See invitation below. We are excited to announce the Leadership Steering Network for the Shop.Work.Play Central Dandenong vision and project will be meeting on Monday 1st June. This network will oversee the action plan in the short and long term. We look forward to this important founding meeting. Great news the City of Dandenong has agreed to back the Work.Shop.Play Action plan which we have co-designed together. Office workers, retailers, cultural organisations and social enterprises have designed 9 major actions to create sparks of change in the city! 1) Retailers & Office Workers Event on 26th June to be held in Cantral Dandenong Office. Email emily@sustainableeveryday.com for details. The event will be an opportunity for retailers and office workers to connect, helping to develop relationships and grow a sense of community between local business/cultural places and office workers. The event will showcase retailers in Central Dandenong, as well as share the rich art and culture of Central Dandenong, and launch the action plan. Develop a simple publication with special offers for office workers, to be handed out with existing promotional material at the pop-up events. Included will be special offers such as local retail discounts, invitations to arts and cultural events in the local area, and further information about the range of experiences on offer in Central Dandenong etc, This guide will also be handed out to all of the leaders at the government services offices, as well as other larger offices. 4) Convenience Shopping Carts / Jeeps Locally manufacture and design approximately 20 - 25 retro style shopping carts for office workers to wheel through Central Dandenong to help them carry their Shopping and goods back to work. These carts will be designed and manufactured locally (subject to cost). There are over 10 Government services and other offices in Central Dandenong who would be interested to be a host of the carts. There will be a security pass sign in – sign out system connected to each cart and this will also be a way to record how many times the carts are used each day and week. 5) #MyDandenong Stories is the ongoing development of stories and sharing what people love about Dandenong via social media and word of mouth. The major strategy is to encourage people who experience something spceical in Dandenong to share their experience through hashtags, posting and promoting stories. Other innovative ways to encourage #mydandenong is to place the 'paint strip' of the food brand in particpating stores which is to 'probe' people to hashtag back their story. 6) Food Box Delivery Service: In partnership with a social enterprise, Dandenong Market develops a Food Box Service for office workers. Initially this will be a Pick up service, but over time grow into a delivery service. There is a potential market for delivery of food to offices which needs to be tested and tried. 7) Urban Design Strategy: Each of the actions outlined so far are the beginning of innovative ways to ‘kick start’ a shift in the way Dandenong office workers, local retailers, local food providers and the local community in general negotiate, use and view Central Dandenong. As people begin to shift the way they use and perceive Central Dandenong, we will be able to track the trends, strengths and weaknesses of Central Dandenong, and use this information when considering the urban design and place making strategies for v in the future. 8) Street Markets: Investigate the feasibility of running street market(s) on a non-market day. i.e. Wednesday or Thursday every week. 9) Governance & Leadership Steering Committe: The Leadership team will be made up of a group of government office workers. They will oversee the implementation of the Action plan into the future. This team will also form of ‘network’ to connect similarly enthusiastic people to innovate and work together on other actions which will connect office workers into the retail space within Central Dandenong.